The Northerner, the newsletter of the Northern Canada Study Group, covers the postal history of northern British Columbia, the Yukon, the Northwest Territories, northern Ontario and Quebec, and Labrador up to the present time. The Northern Canada Study Group also discusses early Manitoba (up to 1905) and the Provisional Districts of Alberta, Assiniboia, Athabaska, Saskatchewan, and Keewatin. The group publishes The Northerner five or six times a year. All back-issues of the newsletter are available to study group members and PHSC members here. The group publishes The Northerner several times a year. All back and current issues are available to study group members and PHSC members here. For information about this study group, please contact Gray Scrimgeour. A CD publication, Early Saskatchewan Post Cards is now available, and described here. See also the new website from the University of Saskatchewan showing vintage picture postcards of the Qu'Appelle Valley. 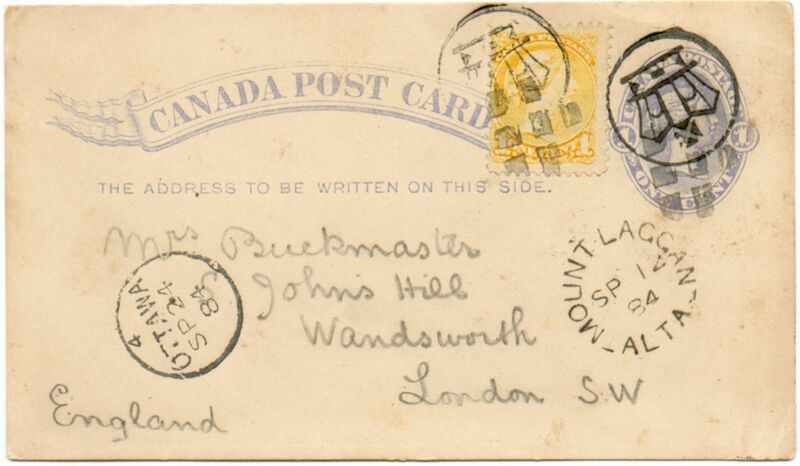 Postal stationery card mailed at Mount Laggan, Alberta on September 14, 1884. At the Dead Letter Office in Ottawa, the card was uprated with a 1-cent Small Queen stamp (cancelled with a cork and an Ottawa crown). Mount Laggan, open for only 13 months, was a CPR end-of-track post office in the Rocky Mountains. 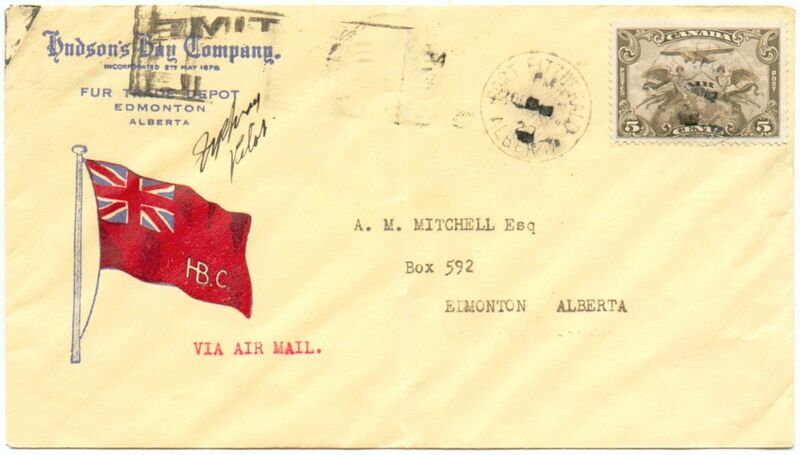 Air mail cover mailed at Fort Fitzgerald, Alberta on December 13, 1929 and received in Edmonton on the same day. The flight from Fort Fitzgerald to Fort McMurray was one of the first regular official flights on the Northwest Territory air mail route. The cover was signed by W.R. "Wop" May, famous Canadian bush pilot.